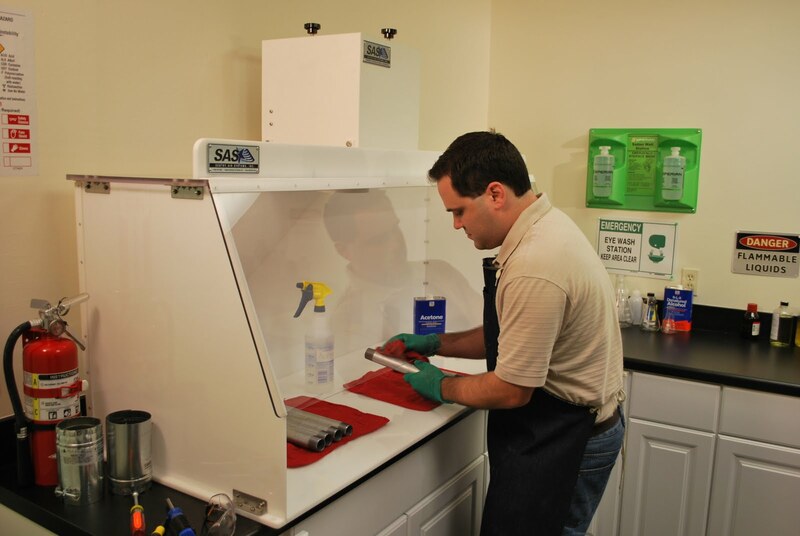 Customizing Your Fume Extractor in Five Steps - Sentry Air Systems, Inc.
Workspaces and applications differ from person to person and company to company. 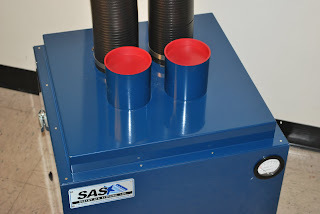 Fume extraction is not “one size fits all”, which is why we at Sentry Air Systems emphasize modularity in our fume extraction and air purification products. All of our fume extractors start from the same basic concept: an efficient and reliable recirculating air cleaner equipped with a powerful fan and high-quality filtration media. 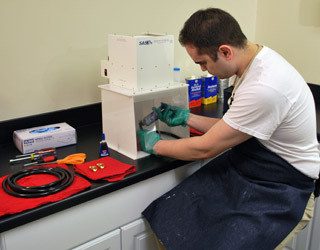 If your fume extraction needs happen to change in the future: simple alterations, additions, or accessories can be added to your existing Sentry Air unit to transform it into a new configuration. 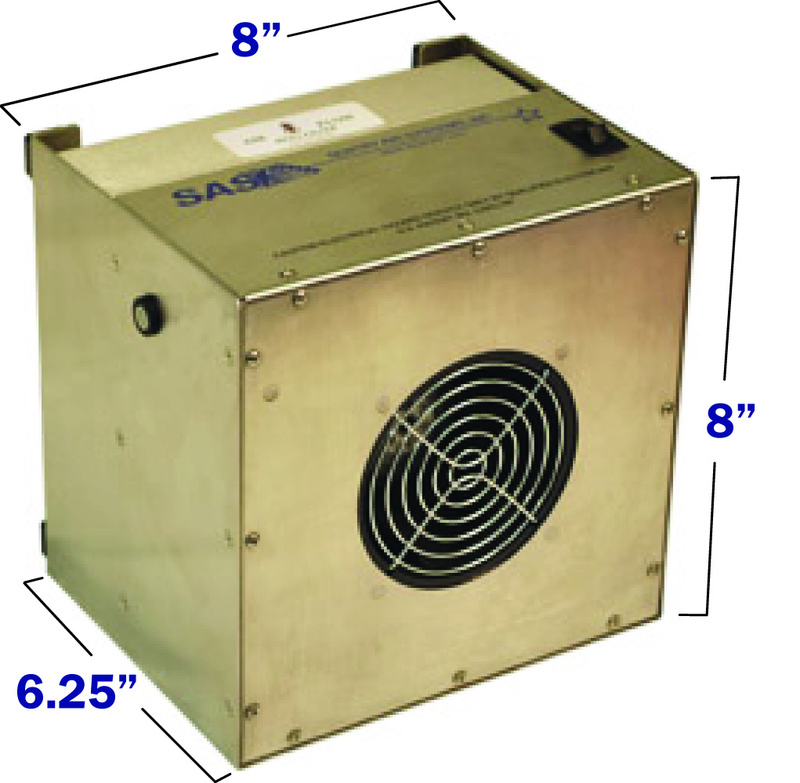 Pictured above is a Model 300 Portable Room Air Cleaner; the basis for the modulardesign of Sentry Air Systems’ fume extractors. Now that we have a base model, the first step in the customization of your fume extractor is determining how much air volume you will need to effectively capture the fume or particulate of concern. 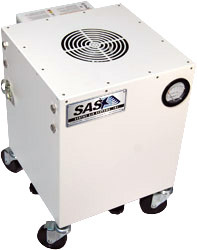 A Sentry Air Applications Specialist can assess your application by asking some brief questions about the volume of particulate or fume being dispelled, the nature of your workspace (to see how close a fume extractor can be placed to your application), and a variety of other questions that will allow the Specialist to select the most appropriate air volume. The second step in designing your customized fume extractor is the selection of filtration media. Every application is unique, so a Sentry Air Applications Specialist personally selects the filtration media that best suits your needs by asking specific questions about your process, material, workspace (environment), volume and time of the application, and more. 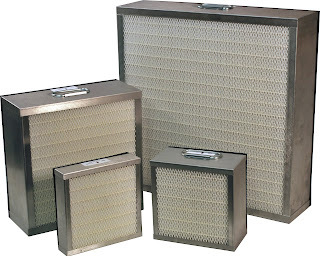 HEPA Filtration– up to 99.97% efficient on particles 0.3 microns and larger. ASHRAE Filtration- up to 95% efficient on particles 0.5 microns and larger. 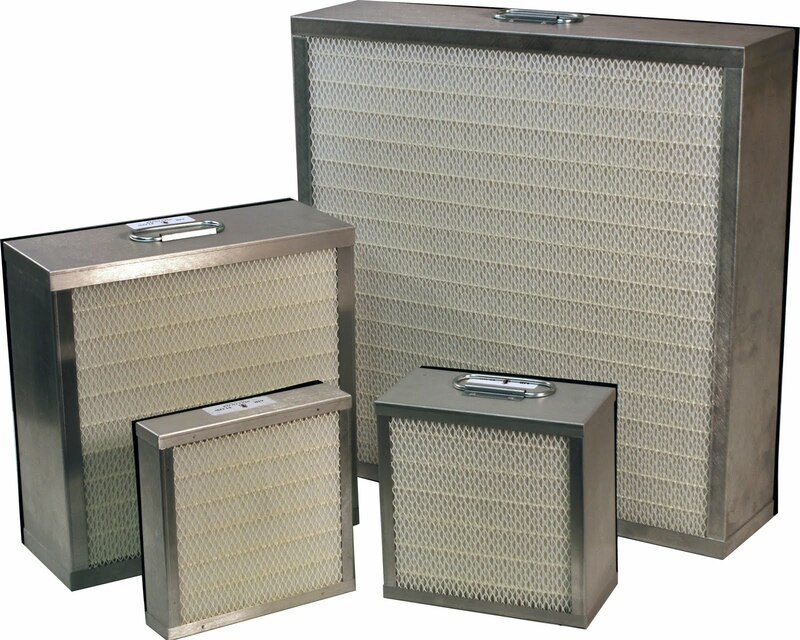 ULPA Filtration– up to 99.9995% efficient on particles 0.12 microns and larger. In some instances, multiple “levels” of filtration media are utilized. 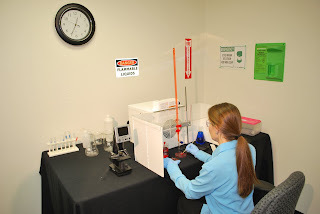 For example, if the operator is extracting organic fumes in a clean room, we would utilize both an activated carbon filter and a post HEPA filter to ensure that the clean room does not lose its integrity. We are also able to special blend several different sorbent filter media as well, including acid gas, aldehyde, ammonia, and mercury media. The configuration of your fume extractor should be based on a variety of factors, including workspace area, how close you need to be to the source of emission of your application for efficient capture, the number of operators, and many more factors. Portable Room Air Cleaners are designed for ambient air cleaning. 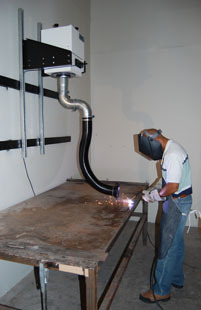 Most welding operations require source-capture fume extraction that quickly captures harmful fumes at the source of emission. 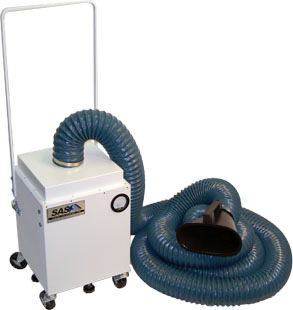 Portable Room Air Cleaners may be a good secondary engineering control; however, these units do not give optimum operator respiratory protection because they are typically not placed in close proximity to the application and do not offer a source-capture accessory like a flame-retardant, self-supportive flex arm [See The Model 400 Welding Fume Extractor as an example]. 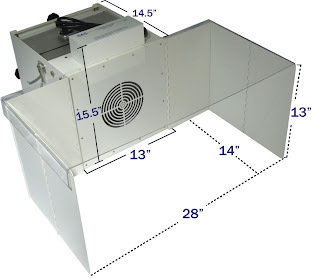 Ductless Fume Hoods offer excellent fume containment; however, a unit like this wouldn’t work well for welding applications because they typically don’t offer enough space or flexibility for the operator. The high heat nature of the application also has the potential to damage the hood material [depending on the composition]. 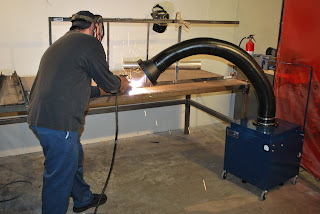 A local exhaust fume extraction system with flexible self-supportive arm works very well for many welding applications. 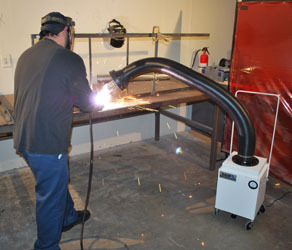 The Model 400 Welding Fume Extractor pictured below features heavy-duty casters, a portability handle, and a flame-retardant, self-supportive flexible arm that the operator can place in the most efficient position for their application. This unit offers flexibility, portability, and most importantly: a source-capture configuration. What Configuration Will Work Best for You? We recommend first taking a look at your workspace. 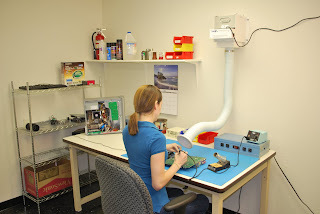 If you primarily work on a workbench or tabletop station: can that benchtop space also comfortably accommodate a fume extractor? 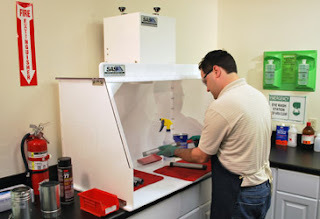 Another benchtop option is the Ductless Fume Hood, which typically will contain the application. Sentry Air’s standard Ductless Fume Hoods range in size from 12″ Wide to 70″ Wide. Step Four: Do You Have Multiple Operators/Stations? Another factor to take into consideration is the amount of operators you have or the number of fume extraction “stations” you would like to create. In many cases, especially if your operators are in relatively close proximity to each other, you can use one powerful fume extractor as the fume extraction “hub” and supply source-capture flex arms to multiple operators. For instance, the air cleaner on the fume extraction model below is capable of up to 950 CFM on the high setting, so each arm is individually capable of up to 235 CFM. We need to determine what product options or accessories you’ll need. If you have chosen a source-capture model that will be equipped with a flexible arm: which specific arm will work best for your application? For instance, let’s assume again that you have a welding application. What flexible arm would work better for you? A self-supportive arm or a “python-style arm”? The “python-style” hose (shown below) works very well for confined space or elevated applications like tank welding, rapid location welding applications, and welding on metal beams. 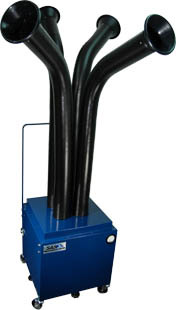 This hose has a magnetic capture hood that can be attached to various metal surfaces for hands-free operation. A Magnehelic Gage– The Mag Gage can be installed in almost every product that Sentry Air offers (excluding series 100 and 200 units). It monitors filter capacity, which is especially important if you’re working with possibly hazardous materials. 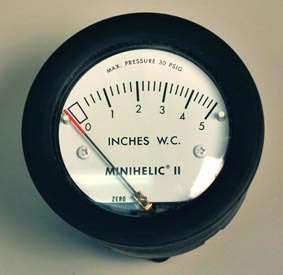 Air pressure will drop as the filter reaches capacity and the mag gage displays this on its easy-to-read face. 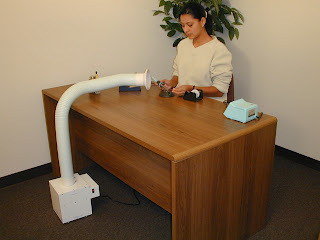 Hour Counter– The hour counter displays the hours the fume extractor has been operating. This helps with filter change-out schedules. Endcaps- If you have a multiple-operator fume extractor, but do not need to use all two or four arms at all times, inlet plugs can be used to plug inlet ports and create stronger suction in the remaining flex arms. Other accessories include Variable Speed Controllers, Remote Speed Controller, Spill Trays for Ductless Fume Hoods, and Velometers. These five steps should help to give you a general idea of what fume extractor may work best for your application and workspace. 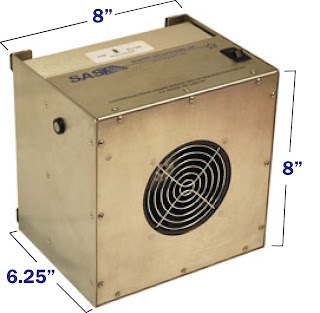 If you would like to view more product options from Sentry Air, visit http://www.sentryair.com/.